SearchMash, Google's experimental site launched last year to test new user interfaces for search results, has a Flash version (requires IE/Firefox and Flash 9). The site uses tabs to let you seamlessly switch between different search engines: web search, image search, Google Maps, Wikipedia search and more. When you click on a search result, you won't open the page as you might expect, instead you'll see a sidebar that shows a snapshot of the page, the snippet and three interesting options: see more results from the site, go to the homepage and read the page from Google Cache. Google uses snapshots provided by Snap, who also uses them to power its search engine. You may remember Snap from the annoying little bubbles that pop up every time you hover over a link in many blogs, hoping to "enhance links with visual previews of the destination site". It's easy to move between search results by using keyboard shortcuts (up and down arrows) or the mouse wheel. To go next set of results, you can press Page Down. Unfortunately, it's not that easy to actually visit a search result, which is the main purpose of a search activity. You'll need to either double-click on a result or click on the snapshot from the sidebar. Google will open the result in a frame, so you can't see the URL in your browser's address bar or link to the page unless you remove the frame. Google had to use frames to save the context of your search, but the result is very bad. For images, Google shows in the sidebar a snapshot of the page that embeds the image, a link to the site and information about the image size. Now it's much more difficult to find the image and you need more clicks to find your way. The video section lets you play videos in the sidebar, but fails to properly indicate the source of external videos and Google continues to host third-party content. The frames from SearchMash team up with Google Video's frames to make your life miserable. The flashy SearchMash has a list of recent searches, but it's not that easy to find it. All in all, the Flash interface doesn't bring enough value to compensate for the many usability problems. While it's easy to switch between results using keyboard shortcuts or the mouse wheel, that doesn't justify using Flash, especially if you realize that most people won't know about that. It's also very difficult to link to a search result, the thumbnails are too small to be useful and only slow down the page. Some things I'd like to see in Google's search interface from this experiment: link to the homepage of a site, search inside a site, keyboard shortcuts for switching between results, a list of recent searches. Am I the only one who thinks that Google search interface should improve and bring more relevant information on the first page. Like Ask.com, where they suggest more refined search queries on the left pane(yeah google has this experimental feature going on) and they also show thumbnails of images on the right hand side, along with definitions etc. Well, it seems that Google's innovation came from the uncluttered homepage and fast-loading system. I see no reason to add anything else; that would just eliminate Google's ground-breaking appearance. It's too bad things like blogs have a hard time capturing that Google appearance. I'm so much of a Google fan, I edited my blog Geekie.org to add an additional Google custom search box beside my WordPress search box. And they look integrated! 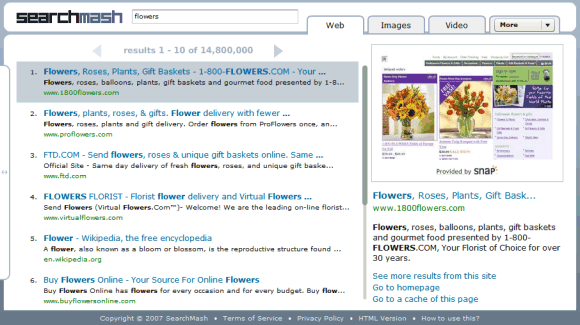 It had the interactions given in searchmash a long time ago... And supports many search engines too!